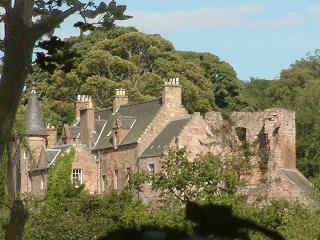 Hawthornden Castle is located a mile (1.5 km) east of Roslin (Midlothian). Dramatically situated on the north bank of the River North Esk, Hawthornden was the home of poet William Drummond, who built a new house (completed 1638) around a ruined 15th Century tower. Visitors to the castle included the English play-wright Ben Jonson (1618) and Dr. Samuel Johnson and James Boswell (1773). The caves beneath the castle are said to have given shelter to Robert the Bruce. The castle remained home to the Drummond family until 1970 and is now owned by philanthropist Drue Heinz, publisher of the Paris Review and widow of H.J. Heinz, former Chairman of the American "57-varieties" food company. Part of the castle forms a private retreat for writers, patronised by the likes of Alastair Gray (b.1934) and Ian Rankin (b.1960).